Last Sunday we said “Farewell” to our Summer Seminarian Patrick Ryan. His ten weeks with us at OLM have ended and returns to pursue his studies for the priesthood. We are grateful for his time here and we continue to pray for him and his vocation to the priesthood. I thank the many parishioners who came to the “Farewell Reception” at Mercy Park last Sunday. Your support of Patrick and your well wishes are appreciated. I also thank the many volunteers who helped organize and prepare the wonderful reception. Next Sunday at the 10:30AM Mass we welcome OLM Parishioner Laura Makin. She graduated from Providence College this past spring and now she is to enter the Dominican Sisters of St. Cecilia in Nashville, Tennessee as a postulant in the coming weeks. We will acknowledge her vocation to the consecrated life and pray for her at the Mass. Laura and her family will be in attendance at the Mass celebrated by Bishop Evans. Dominican Father Patrick Mary Briscoe, OP of St. Pius Church in Providence is to preach the Mass. Also joining us at the Mass are other Dominican Friars and some of the Dominican Sisters who serve at St. Pius Church. Please join us in celebrating this great event in Laura’s life and in the life our parish. There will be a reception following Mass in Mercy Park. 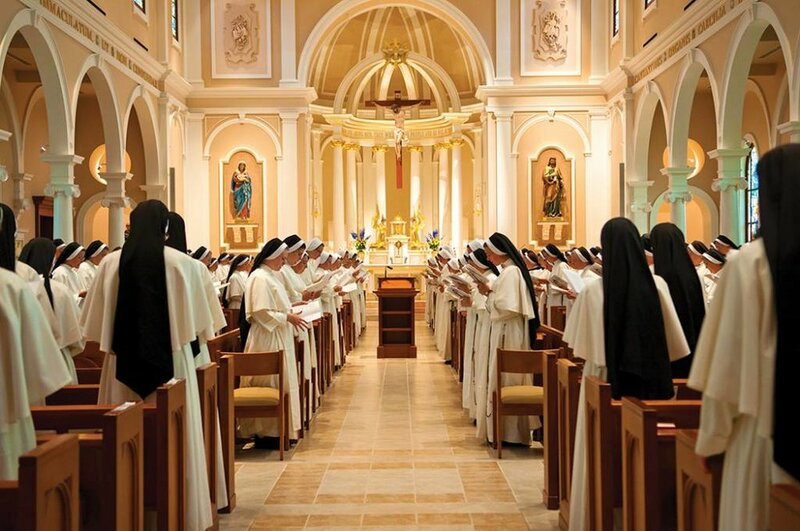 The Dominican Sisters of St. Cecilia are commonly called the Nashville Dominicans. The Dominican Order was founded 800 years ago by St. Dominic and the Nashville Congregation was founded in 1860 with the arrival of the first four sisters in Nashville, their early work, and the establishment of St. Cecilia Academy. Over their 150 years there has been an observable growth in the life and vitality of the young community. The Congregation has experienced 64% growth since the year 2000 with 300 sisters in the community, the largest ever in their history. The median age is 36 with 58% of the Congregation under the age of forty. With an average of 18 young women entering the convent as postulants each year, the novitiate has an average of fifty sisters. The Congregation has expanded its apostolate to 33 schools located in the United States, including the Congregation’s own college in Nashville. The sisters are also present in 10 schools located in Rome and Bracciano, Italy; Sydney, Australia; Vancouver, Canada; the Diocese of Aberdeen, Scotland; Diocese of Roermond in The Netherlands and the Diocese of Limerick, Ireland. Here in Rhode Island they administer and teach at St. Pius School. The Mother House of these good sisters is located on thirty-two acres located in downtown Nashville, St. Cecilia Motherhouse is an oasis on the north side of a busy southern city. St. Cecilia Motherhouse was completed in 1862. Additions in 1880, 1888, 1904, and 2006 completed the building. Today it houses the sisters in formation in the novitiate, the sisters who administer and teach at schools in Nashville, sisters who serve the community through specific duties at the Motherhouse, and many retired sisters. During her postulancy, Laura begins a year of immersion into the life of her new religious family. She attends all community prayers and practices the monastic customs that are a part of our life. During this year she becomes acquainted with the basics of Dominican spirituality and history, along with the charism of our Congregation. We congratulate Laura on her decision to pursue her vocation to the consecrated life. Please join us next Sunday in recognizing her vocation and praying for her as she enters the convent. May God continue to bless her and the Nashville Dominican Sisters with joy, faith, hope, and love! Pray for more vocations! Do good. Be well. God Bless. Go Sox!